Game Information: Aloha! Cluster Pays is one of NetEnt’s most renowned games. The game features 6 reels and 5 rows, boosting your winning opportunities compared to regular 5 reel, 3 row pokie games. The game is set on a tropical island, where the local Tikis keep things entertaining with their endearing charm. The volcanos in the background does not only add to the theme, but actually serves a purpose as seeing an erupting volcano means you have hit that sensational winning combination. Aloha! 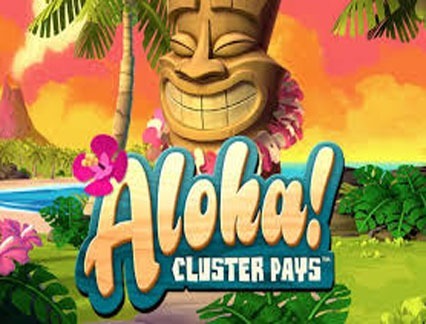 Cluster Pays is an exciting online pokie game and one of the most popular titles produced by NetEnt. This game is playable across all devices and includes 6 reels and plenty of opportunities to win big. The game is unique in that it uses the Cluster Pays mechanic, where you earn more wins whenever a cluster of the same symbol is formed. Players will enjoy plenty of fun and rewards on the reels in the form of stacked symbols, wilds, and free spins and more, while a Symbol Drop mechanic awards wins up to 2,000 times your stake. Aloha! Cluster Pays is a 6 reel slot featuring five rows and no standard paylines. Wins are earned when clusters of 9 or more symbols land on the reels in a horizontal or vertical line. The symbol represented on the reels are consistent to the theme of the game and includes 3 Tiki masks, a pineapple, half a coconut, a flower and a shell. The wild symbol is represented by a box with a question mark and replaces all other symbols on the reels to complete winning combinations. The only symbol it does not replace is the free spin icon. The biggest payout you can win is earned when you fill the entire screen with 30 red Tiki masks, which awards 10000x your total stake. Sticky Win Respins–This feature is triggered at random after any win. Once triggered, you will see the same symbols involved in your win freeze in place for a free respin. If any new symbols add to the cluster, another respin will be triggered. This continues until no more matching icons land on the reels. 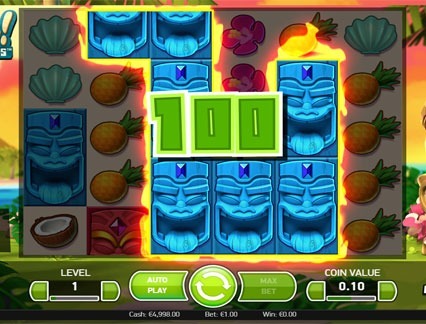 During the free spins, all lower symbols represented by fruit and flowers will fall away from the reels, with only high value icons remaining in the end. This contributes to higher wins during the free spins round. If the last free spin doesn’t result in a win, the reels will continue to spin until it does. That said, more wins can be won when you land more scatter symbols during this round. 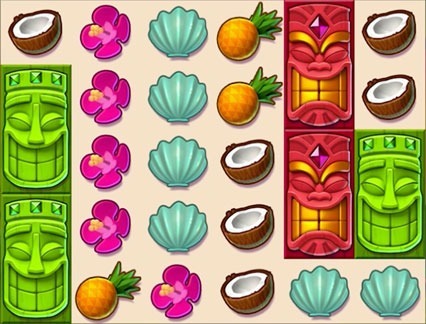 As the title suggests, Aloha features a Hawaiian theme with the game set in the Pacific Islands. This is definitely one of the best and most popular games from NetEnt, so expect exceptional gameplay, graphics and sound effects as you make your way to fantastic wins. The term Aloha means peace, compassion and affection, which is the exact atmosphere the game provides thanks to dreamy graphics and while complimentary music puts you in the holiday mood. The graphics are bold and sharp, which is expected from a game powered by NetEnt. The game is beautifully designed with great colours and stunning graphics that match perfectly with the theme. In terms of sound, the game makes sure players get fully immersed in the Hawaiian culture with traditional music, including a subtle drum beat in the distance and the sound of a wind breeze and birds chirping. You will also hear an occasional man’s voice as well as the eruption of the volcano whenever you make a winning combination. Aloha! Cluster Pays is no a progressive game, although there are plenty of opportunities to win big thanks to great features and bonus rounds. The free spins round is the most lucrative part of the game, earning you up to 60 free spins. What makes Aloha! so special is that it does not have a general payline system. The game makes use of a Symbol Drop mechanic, where low win symbols are removed. This helps increase your potential to win big while the free spins round afford plenty of chances to earn additional rewards.